Jason joined Jason H. Haber to form Haber Blank, LLP to provide effective and strategic representation to clients. Jason’s practice focuses on criminal and civil litigation and trial work, as well as appellate practice. Prior to establishing Haber Blank, LLP, Jason served as a Broward County Assistant Public Defender, handling all levels of criminal cases ranging from first degree murder to driving under the influence and possession of illegal substances. Jason has represented clients in dozens of jury trials. Jason is AV Rated with Martindale-Hubbell, is “Superb 10.0” Rated with Avvo, and since 2013 has been listed as one of Florida’s “Legal Elite” by Florida Trend Magazine. He is licensed to practice before all courts in the States of Florida and New Jersey, the United States Supreme Court, as well as the United States Southern District of Florida. Outside of the office, Jason remains involved at Nova Southeastern University Shepard Broad Law Center by teaching proper and effective trial skills as mock trial team coach. In 2011, the Shepard Broad Law Center’s National Trial Association honored him as its Alumni of the Year. Jason also teaches lawyers from around the country effective trial techniques and skills as a National Institute of Trial Advocacy instructor. In the community, Jason currently serves on the Florida Bar Criminal Law Section Executive Council, Florida Association of Criminal Defense Lawyers Board of Directors, and Broward Association of Criminal Defense Lawyers Board of Directors. 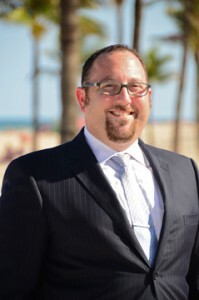 Jason has also been appointed to the Broward County Commission’s Human Rights Board. In keeping his ties to his alma mater, Jason was appointed to the GW National Council for the Arts and Sciences and is the Chair of The George Washington University South Florida Alumni Network. He is also an active member of the Southern Poverty Law Center and the Broward County Democratic Executive Committee.